I won't complain anymore about 95. Glad you loved the movie! I can't wait! Our heat wave finally broke during the night – woke up to cool temps and cool breezes, we even walked to the the store this morning and stopped at the farmer's market. This will last until Monday and then it's back to hot and humid and ugly…but ya know, 2 days of beautiful weather, I'll take it! It's got to be very scary living where forest fires are common. My heart goes out to those people. Stay in the shade, Silver and stay hydrated. how did people survive before air conditioning where you live? I'm in northern Canada and when it hits 80 we think its stifling,, I cant imagine what it must be like, we don't need a/c here but all the newer condos have it in them, we haven't even turned it on yet! Floor shopping sounds ver exciting, I loved choosing stuff for our house! That is incredible! We are in Florida and most people think it gets WAY hotter here than anywhere else but we rarely see any temp above 92…which is HOT enough! Take care and drink lots of water! Enjoy your movie, too! enjoy these 2 days, Grace! We are the opposite; two more days of high head, then back to mid 80's where we normally are. I imagine! We don't have forest fires, they are (usually) wild fires, in open brush areas. Yesterday's bordered that area, but was actually right off a freeway, so likely human started. 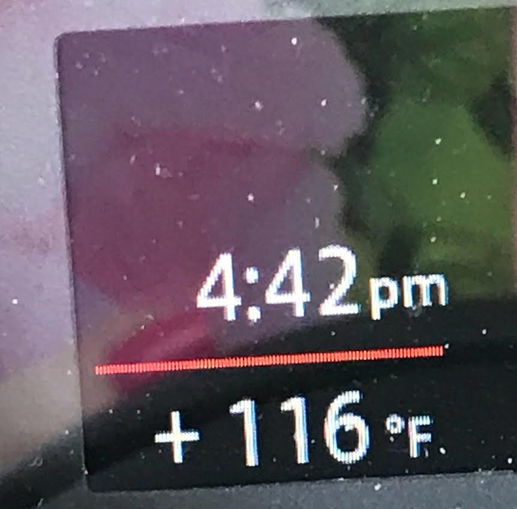 😦 Yes, it was hot out shopping at a few stores. In A/C now for a while. And staying hydrated. Thanks, Jean! We, at worst, only get 1-2 days like this a year. Just coming quite early. Usually August/September are our hottest months. I think we hit about 90 today; I feel like I'm melting. This is unusual weather for cool England. How did we survive? I remember first small oscillating fans, then room-based a/c small units. and we sweat a lot, and didn't have as many hot days then. It's funny, when we were looking at flooring, it was 'this would look good for upstairs' vs. 'if we needed it in AZ, this would look good in our new place.' Two different colors. Darker for here, but I want lighter in AZ, if I get to choose. Yes, but we don't have the humidity here. Our humidity is only 30% or lower. It's more like a blast from an open, heated oven. But yes, staying hydrated. Thanks! Yes, I was shocked that Canada and England have been sweltering as well. Hope it doesn't last long for you, Sue! That’s a scorcher for aure! Hope there are no more fires! Wow, that is hot! We've been going through a heat wave but ours pals in comparison to that. With it being so hot where you live, are you able to have a longer growing season ?Do you garden? Very sorry to read about homes in the fire. I have a friend who lives on the coast. Terrible fires.Happy Movie going. We saw that one. Did you see The Incredibles? Wow that is HOT. I've NEVER been in weather that hot. I'd rather have my snowy winters. : )Terrible about the fires. it's going to be interesting. usually I have to wait until late November before any kind of autumn temps. now with it so radical all over the country I imagine we will just start skipping fall like we did last year! we had two seasons. Warm winter and Hot summer! and you're right. it's the humidity. 76% and higher. I hope you won't miss your ocean! It's not that bad up here in the (semi-) high country. After the cloudy weather and raindrops moved through this afternoon I've had the house wide open. Hi Lisa! Well, at least you got a one day break. That sounds lovely! We topped out at about 103. Still very hot, but at least quite a drop from Friday. Hi Cheryl, and welcome! I know, fire fighters are such amazing humans! Yes, but you have humidity, I'm guessing? Ours is very low. that helps. Our growing season is 12 months of the year (i.e., nonstop) except for the most tropical of plants, who we have to be careful that 1-2 nights of frost per year. We have to force roses to go dormant with a hard prune in Dec. or Jan. They are still blooming when we cut them back.We haven't seen the Incredibles. We almost never see animation in the theater. Actually, I've been feeling guilty, knowing my time with oceans is dwindling, and yet I NEVER go. My bad. So no, I don't think I'll miss them. I do a beach decor, and I have many beach photos I've blown up to poster size and framed, so I'll always have that. It seemed as though most of the country was experiencing crushing heat last week. In fact, I saw a heat map that showed much of the world in red. I have vacationed in Arizona desert in the summer temps over 100. It seemed forbidding at first but I ended up really enjoying the tour we took. I have been nostalgic for the trips out west that I took with my husband. I need to dig out some old photo albums and wallow in some memories. awwww. If you ever plan to make it this way again, please let me know! I'd love to meet up for lunch or something! Wow, that makes our high of 101 look balmy. Stay cool. As you probably know we have a house in AZ as well as in the UK and even we avoid being there during July! But saying that I love it, but only because they are so geared up for the heat that every where has a/c. Now here in the UK we are having hot weather and no where has it, so it gets very tiring in the end! Joe, I only knew that you visited recently. Didn't know you had a place there!